Fabulous Frogger: It's a Blog...blog....BLOGAVERSARY Partayyyy! Enough rambling....let's get to the good stuff! I thought long and hard and soft and short....... and at first I was going to go through my humongous stash of goodies...then I was going to do some shopping...but instead what I decided was to get someone what THEY'D like..... so for my 1 year celebration I'll be giving away a $50 gift certificate/card to anywhere that offers them! ﻿Basically.....as long as I can buy a gift card or certificate from a store (they have to accept US dollars...but they all do, don't they? ).....you can choose it! All entries will be given a number and the winner chosen by my good ole' number generator. Winner will be announced sometime on Saturday! Good luck...and thanks for hanging in there with me for the past year! I'd love a chance to win! I'd choose either HAED or 123- you can never have too many patterns, can you LOL! I also have no idea how to spell it, so no help there. I would love to be entered into the draw and the shop I choose would be 123Stitch as I would love to try QSnaps and they post to South Africa. Wow! What a generous give away! Sign me up! I would want either HAED or 123Stitch - I love the charts from HAED, but I need some materials from 123Stitch to do them! Either one is fine with me! And I posted this on my blog too! Congrats on your 1 year anniversary! I can't wait to look around. :) I'd love to be included in your drawing. I would love an HAED gift card if I am lucky enough to win please. Thank you! I just wanted to say to Terri...I have 3 Eskies too! Congrats on your Blogaversary! I see that our tastes include many of the same artists, too. Your giveaway is very generous! If I were to win, I'd choose 123stitch. I used to keep a blog, but now I don't. *sigh* I keep thinking I should go back to it, but I never do.. Very kind giveaway. I love me some HAED patterns BUT I need materials, so if I win could I have a giftcertificate with either Cross Stitch Heaven, or Across Town Stitching(great deals on floss for us living in countries charging an arm and a leg for floss)? Wow, what a generous giveaway prize! Congrats on your 1st blogaversary. Even the predictive text on my iPhone can't spell it!!! Would love to be counted in the giveaway. My email is in my profile. How to choose... I haven't shopped at 123 stitch so maybe I would choose them or one of the other suppliers, or maybe a HAED chart or two!! Your drawing is on my birthday - will that be a good omen?? Fantastic giveaway & well done on a year of blogging! Congratulations on your 1 year annevercery! I would love to join the draw and the store I choose will be HAED. I would love to join the draw and the store would be the crafty kitten. Congratulations on one full year of blogging, Lesli. I hope you have many, many more. I'd have to choose 123-stitch as I have a few charts to kit up and that would be handy. Congrats on your blogaversary Lesli. I would love to be entered in your giveaway for HAED certificate. My email lbarge@msn.com. Thanks for the opportunity. I would love to enter please Petal. Might be just what the doctor ordered. I would love HAED gift voucher, seems appropriate considering we are tryIing to boost sales at the min. I forgot to leave my email addie. Congrats on your Blogaversary, dont know the correct way of saying it either. If I was lucky enough to win I would love a Silkweaver voucher, would love more fabby. Happy Blogoversary . I'd love to enter please . I'd choose either HAED or 1-2-3 stitch . Happy, happy Blogoversary! At least, that's how I spell it ^.^ Here's to many, many more. What a generous giveaway. I've always love 123 Stitch for their wonderful customer service so that would be my choice though Crafty Kitten is tempting too. LOL! My email: veronicaoyh at gmail dot com. it is such a sweet giveaway..
and the store is 1-2-3 stitch. lesli, congrats on 1 year of blogging. I would love to be entered in your giveaway. I would like eiter HAED or 123-stitch. My email is jennilynn1973 at gmail dot com. Huge congratulations on the 1 year anniversary.... I'm a fortnight away from my 2nd anniversay at Gizzimomo's Stitchy Place and while I may have a giveaway it won't be a huge prize like this one though! Please enter me into the draw for either Cross Stitch Heaven, Crafty Kitten or HAED (you choose if I win for the surprise). My email is thea(dot)wilson(at)ntlworld(dot)com. I would love the chance to win your draw...I do follow you. I would choose Jo Ann's... my email is: ghorton1@cox.net. Congratulations on the anniversary milestone! I am a follower and enjoy your blog. i would love to have the gift certifate from 123 stitch. Cong on your blog anniversary. I would love to be included. My email is ccflo3@gmail.com. 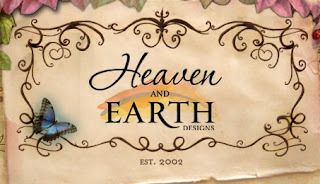 I would love a gift certificate to Heaven & Earth Designs. I will enter as well please. That is an amazing giveaway. Congrats on your blog...whatever the spelling ;). and I would love a Crafty Kitten voucher. Thanks for such a fab giveaway. WoW, what a seriously great Give Away! My Email is khstitchy@gmail.com and I would love a Golden Kite Voucher. Hi Lesli, Happy upcoming Blogaversary. Please enter me in your wonderful giveaway. My choice is 123 Stitch please. My email is KayeDeP@gmail.com and I am a follower. I will also post about your giveaway on the sidebar of my blog. Great giveaway! I am a follower. Ooooh what I could do with a Jo-Ann's Gift Card! Mmmm! Yes Yes! They have those great 40% off or 50% off sales, so a 50.00 gift card there is as good as a $100.00 gift card if I spend it wisely.. I'd love to be a lucky winner! congrats on the blogaversary...love looking at your projects .. so hard to pick which prize or a favorite project. Guess i would have to go with a gift card for HAED . You're crazy! That's a lot of money. I'm very thankful we have gotten to know one another in this past year. I LOVE the HAED you RAKed me and smile every stitch I make. I would love to be entered for 123. Thank you so much for doing this and Good luck to everyone who enters. This is such a great giveaway! And, congrats on the blog anniversary. My choice would be HAED. email addy is lilmomma1279@yahoo.com. What a doll you are offering such a great prize! I'd love to be entered. My choice would be HAED (of course!!) or 123 Stitch. I'll let you choose. I'm totally a follower, I'm commenting, and I say 123 Stitch. I now have enough HAEDs to last a lifetime. Lesli, you are fabulous! I always enjoy your posts and pictures and look forward to another year of your blog! Enter me, please. I'd love a HAED Gift Certificate. my addy is simiandboo@gmail.com. Congratulations Lesli, I have enjoyed your updates. I would love to enter, if I win I would choose 123 stitch. What an awesome giveaway Lesli. I would love a gift certificate to 123 Stitch. If I am lucky enough to win, I will be on vacation that week. Lesli--you are crazy but in a good way! All for HAED!!! windowsblu@aol.com Great idea, and cool blog! Happy Blogoversary! I would love to be included in your draw! 123stitch for me :D I've got one going on too! Boy, all the lurkers come out of the woodwork for a giveaway, huh?! I am already a follower and want to say Happy Blogoversary! Please include me in your drawing and a JoAnn fabric giftcard would be delightful!! Thanks again for visiting my blog and entering and winning my giveaway! I would love the gift cert.from 123 stitch if I were the lucky winner. First, Happy Blogaversary, however you spell it! And thanks for such a generous giveaway! If I were to win I'd love a 1-2-3 stitch certificate. My email is AnnieB63@aol.com. Love all your wips and the brilliant finish of SK Strelkina on your last post. You're friend is really lucky. Congratulations on such a big milestone! I thoroughly enjoy reading yoru blog, please keep it up! Congratulations on coming up to your blogoversary! I'll choose that spelling. :) If I get lucky enough to win I'd love a spree at Nordic Needle. :) Unless I can figure out a way to get it through my LNS... Email is included with my blogger account. Congrats on your Blogiversary! I have been a follower by email for awhile and always enjoy your posts. If I win, I would like a HAED gift certificate. My email is kalisti@comcast.net. OMG, that's SO generous of you! I'd love to be included in the give-away. If I win, I'd choose a gift-certificate from 123-stitch. Happy Blogoversary!! Wow, what a generous and awesome giveaway you are hosting to celebrate, too! I follow your blog via Google Reader. If I'm lucky enough to win, I would love a gift certificate to my favorite ONS - Needlecraft Corner (http://www.needlecraft-corner.com). My email address is SoCalStitcher at gmail dot com. Congrats on your blogathingy (no clue how to.spell it either. ) I would love a voucher to 123 stitch. Congratulations!! I spell it Blogaversary but anything goes really. The important thing is to Celebrate it! I re-read your first post, you said maybe you'd post every month. Well you've managed 47 posts so that's nearly one a week. Guess you found something to say? LOL. I'd love to be included in your giveaway! If I won I'd be interested in a GC to 123 Stitch. My e-mail address is attached to my profile. Congrats on your Blogiversary!! I would love to enter your giveaway - lbyrd1972@yahoo.com - and my choice would be 123Stitch. Some forklift training companies are in it for the short term, to make quick cash, and dont really mind how skilled you end up at the end of the day - which in my opinion is dangerous, and could lead to death or injury for yourself or for people working with you. Companies can save thousands of dollars per year if they can get past the stigma of used goods. With forklifts being one of the leading causes of occupational accidents and injuries, OSHA has mandated every employee handling forklift must get a certification to operate it. Forklifts are by far some of the most useful things to have in your warehouse, but they are also some of the most dangerous as well.